Thanks to all who made the event such a great success. Check out our picture and video documentation and summaries of the panel discussion and workshops, as well as our resources. In the 21st century, the concept of ‘food’ is loaded with many different connotations. Food as a means of physical survival, food as an indulgence, food as a source of income, food as a cultural and social symbol – the list goes on. But how often do we stop to think about the true costs of modern food production and consumption? These sometimes hidden costs include agriculture-driven deforestation, the perpetuation of gender inequalities in traditional farming systems and the negative health impacts of cheap but poor quality food. 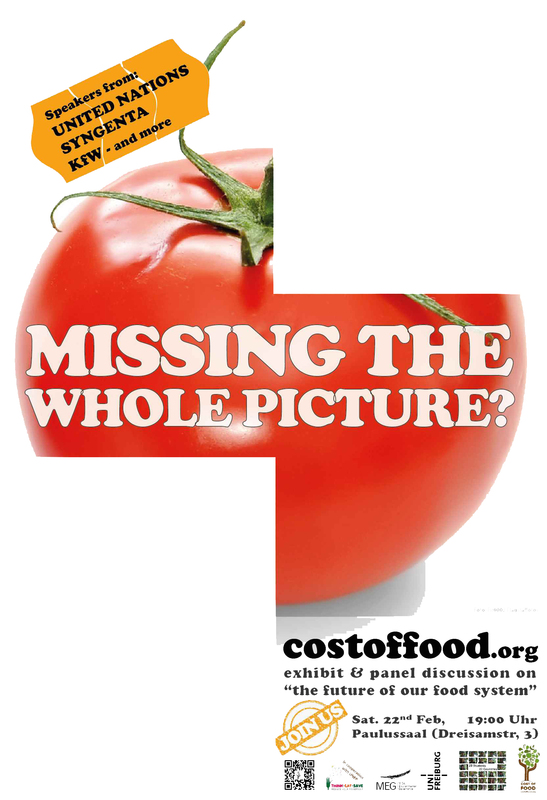 Often such ‘costs’ are not fully (if at all) reflected in food-related decision making on both the production and consumption sides, contributing to the unsustainable global food system we face today. Our aim is to raise awareness of the economic, social, and environmental costs of food so that we can trigger a shift towards a more just, efficient and environmentally friendly status quo. Through this website and other initiatives, we, MSc Environmental Governance students at the University of Freiburg, are on a mission to be the change we want to see.